The BuddyPress team is thrilled to announce that BuddyPress 2.0 “Juliana” is now available! This release focuses on administrative tools, performance, and improvements to the activity stream. Let’s take a look at some of the highlights. 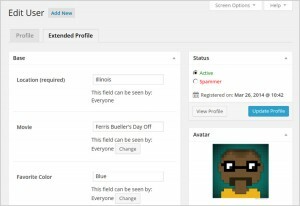 Profile editing – Need to manage a user’s profile information? 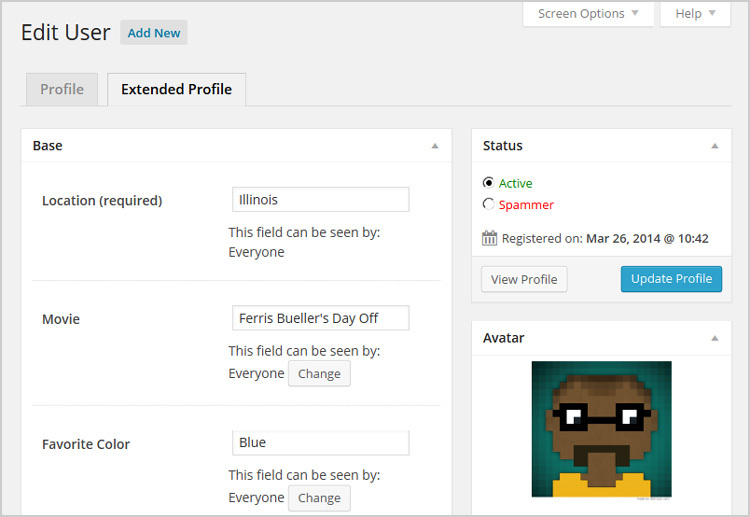 We’ve integrated a new “Extended Profile” tab into the Dashboard > Users interface, where you can manage profile data, avatars, user status, and more. 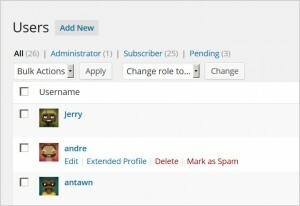 Spam User Management – WordPress Multisite has long had the ability to manage spam users from the Dashboard. We’ve brought the same capabilities to non-Multisite installations. 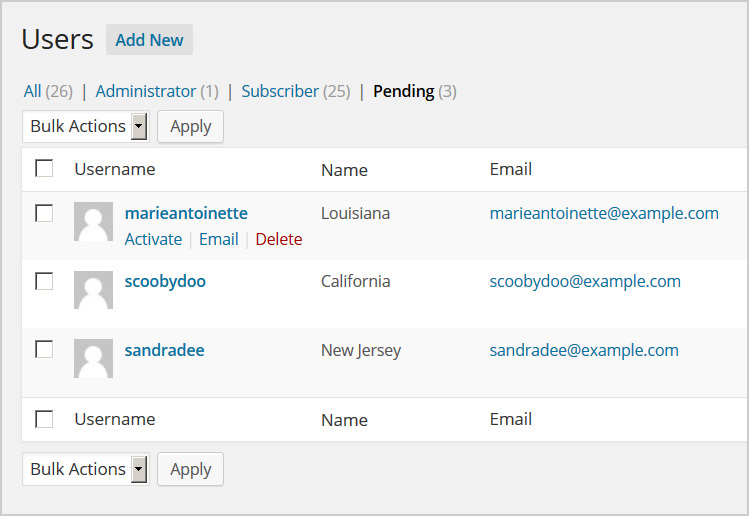 Pending Users – The Pending users tab in Dashboard > Users lets you see a list of signups that have not yet been activated. You can also perform useful tasks like manual account activation and resending activation emails. Repair Tools – Occasionally, BP friend counts and other data can get out of sync. The new Tools screen lets admins manually reset these values. The most successful BuddyPress sites are highly dynamic, with a steady stream of new visitors and new content. This dynamic nature means that BuddyPress is a highly database-driven platform, and database performance is often a bottleneck when it comes to scaling BP sites. BuddyPress 2.0 tackles this problem head-on. We’ve streamlined some of the most common problematic queries – such as those in the Members and Activity directories – to shave up to 95% of the query time off of certain individual queries. The sheer number of queries has been dramatically reduced as well, so that single page views access the database up to 50% less than in BP 1.9. And we’ve totally overhauled the way that BuddyPress utilizes advanced caching systems like APC and Memcached, so that users of these systems will see up to 75% fewer cache misses on costly queries. If you’re a BuddyPress developer or site administrator, you can get more in-depth explanation of changes and an overview of selected benchmarks in this post on bpdevel.wordpress.com. If you are a BuddyPress user, you can just sit back and enjoy the speedier pageloads and reduced server overhead of your BuddyPress 2.0 site! Spend a lot of time viewing the activity stream? 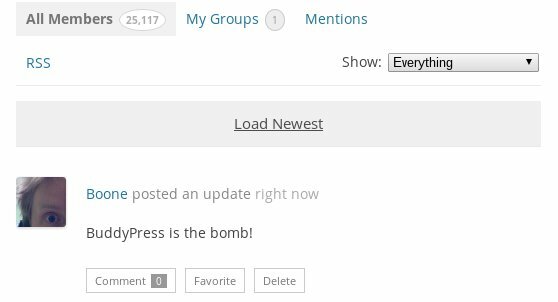 BuddyPress 2.0 automatically lets you know when new items are ready to be loaded. The activity stream is better integrated with blog posts, too. Comment on a blog post, and an activity item is posted. Comment on a blog-related activity item, and a blog comment is posted. No more worrying about fractured conversations. We’ve also reworked the way that phrases like “Boone posted an update” are handled, so that they’re always up-to-date and always translatable. BuddyPress 2.0 introduces dozens more small features, and fixes scores of bugs. 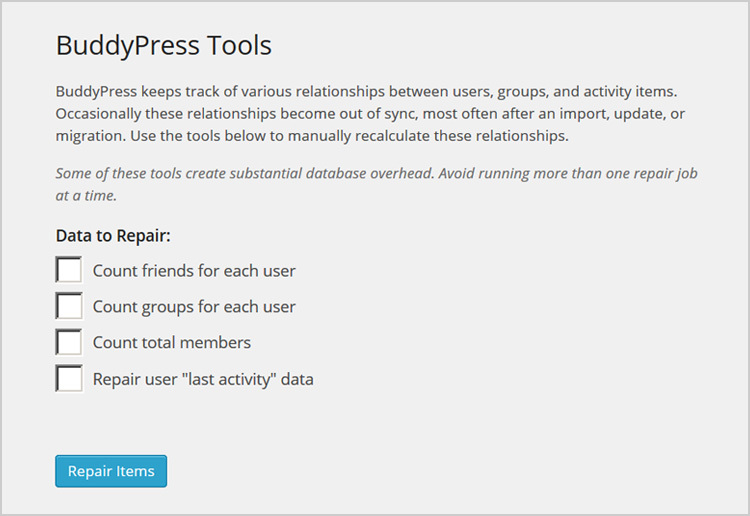 We’ve compiled a complete 2.0 changelog on the BuddyPress Codex. BuddyPress 2.0 is named for Juliana’s Pizza in Brooklyn, NY. Juliana’s is the second pizza establishment opened in the same location by master pizzaiolo Patsy Grimaldi (it’s a long story), and was also the locale for a serious BuddyPress powwow and up-close dining experience by two members of the core team. For these reasons (not to mention the outstanding pizza) we think that BuddyPress 2.0 “Juliana” has a special ring to it. boonebgorges, Bowromir, burakali, chouf1, cmmarslender, danbp, dcavins, Denis-de-Bernardy, DJPaul, ericlewis, glyndavidson, graham-washbrook, henrywright, henry.wright, hnla, imath, johnjamesjacoby, karmatosed, lenasterg, MacPresss, markoheijnen, megainfo, mercime, modemlooper, mpa4hu, needle, netweb, ninnypants, Pietro Oliva, pross, r-a-y, reactuate, rodrigorznd, rogercoathup, rzen, SergeyBiryukov, shanebp, SlothLoveChunk, StijnDeWitt, terraling, trishasalas, tw2113, vanillalounge. Many thanks to these contributors, and to all who have pitched in the forums and elsewhere. One final point. Technically, BuddyPress “2.0” is just the version between 1.9 and 2.1. But still, there’s something special about crossing into the 2.x series, especially given the timing: we just crossed 2 million downloads, and it’s been almost exactly five years since BuddyPress 1.0 was released. On behalf of the core team and contributors, I’d like to extend a few special thanks: to founding developer Andy Peatling for getting the ball rolling; to Matt Mullenweg for providing support to the BuddyPress project; and especially to the many thousands of BuddyPress users who have followed and advocated for the project over the years. If BP has done great things for the thousands of communities that depend on it (and I think it has), it’s because of the incredible community around the software itself. A million Two million thanks to all of you. 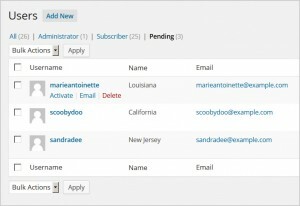 You can get BuddyPress 2.0 from the wordpress.org plugin repository, or right from your WordPress Dashboard. As always, questions, comments, bug reports, feature requests, and general laudatory remarks can be directed toward our support forums or our development tracker. Thanks A lot for all these awesome Features. I just upgraded to BP 2.0 and immediately lost ALL admin rights to my entire site after the upgrade completed. ??? Texrat – Please post details to https://buddypress.org/support. Three million thanks to You for this awesome plugin and this excellent new features! I was waiting for the performance fixes and some improvements on other features from 1.7 and now they are here! This is an awesome update. It has a lot of features that I can see myself using on a regular basis. Admin profile editing is especially welcome. Nice job guys, and thanks for a job well done! Superb! I hope there has been effort made to stop spam signups, Im plagued with spam-bots! I’m not entirely sure what to get excited about most: The administration tools, the performance improvements or the ‘load newest’ in the activity stream! “Juliana” looks awesome all round. Couldn’t have asked for more. Really well done and a big thanks to everyone involved. Congrats on passing the two-millionth download! Thank you so much for your continued efforts developers. 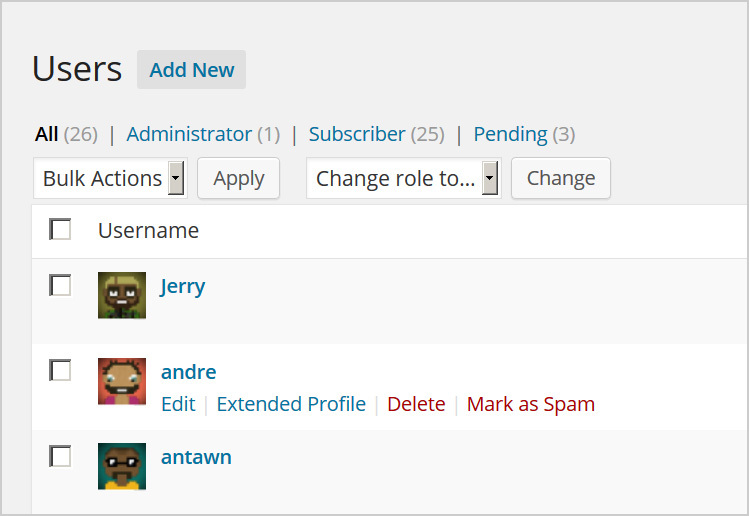 I’m so excited about the future of the Buddypress platform!